CANTON, MA (April 7, 2014) – To help ring in spring, Dunkin’ Donuts, America’s all-day, everyday stop for coffee and baked goods, recently introduced PEEPS® Donuts, bringing together the brand’s famous donuts with PEEPS® Marshmallow Chicks, an iconic sign of spring, for the first time. Beginning today, Dunkin’ Donuts and PEEPS® are giving fans a chance to show off their own “peeps” on Twitter or Instagram for the chance to win a “V.I.PEEP” prize package that includes $2,000 in cash, plus $500 towards PEEPS & COMPANY® merchandise. 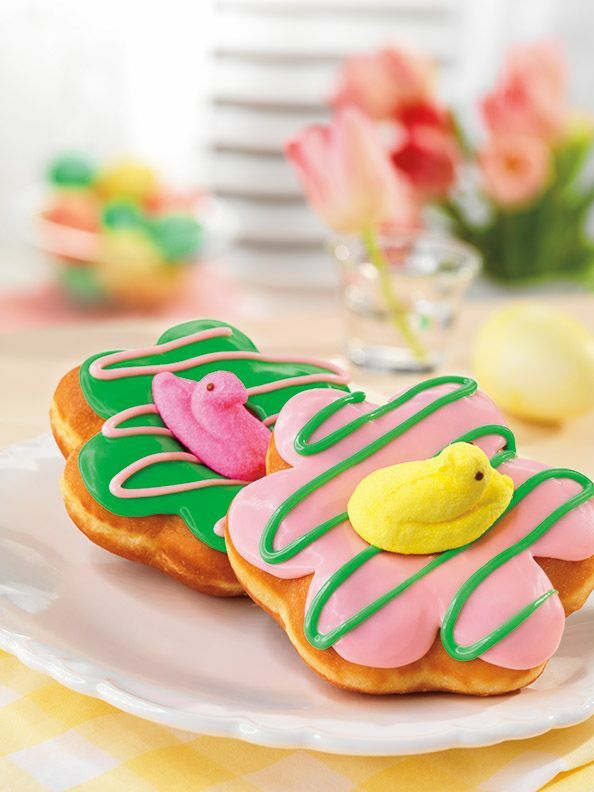 Perfect for any spring or Easter holiday celebration, Dunkin’ Donuts’ fun and unique PEEPS® Donuts are shaped like flowers, decorated with pastel pink or green icing and topped with a pink or yellow PEEPS® Marshmallow Chick. The new PEEPS® Donuts are available for a limited time at participating Dunkin’ Donuts restaurants nationwide. Dunkin' Donuts has been a leader in the donut category for more than 60 years, selling 2.5 billion donuts and MUNCHKINS® donut hole treats annually. Within the United States, Dunkin’ Donuts offers more than 70 varieties of donuts, including beloved flavors such as Boston Kreme, Glazed and Chocolate Frosted. For a perfect pairing with PEEPS® Donuts, Dunkin’ Donuts is once again serving iced coffees featuring a favorite taste of the season, Baskin-Robbins ice cream. For the second year in a row, Dunkin’ Donuts has partnered with its sister brand, Baskin-Robbins, the world’s largest chain of ice cream specialty shops, to offer flavors of iced coffees inspired by Baskin-Robbins’ beloved ice cream. Dunkin’ Donuts guests can sip the flavors of their favorite scoop with three “cool” iced coffee options, including new Cookie Dough Iced Coffee and Jamoca® Almond Fudge Iced Coffee, as well as returning favorite Butter Pecan Iced Coffee.